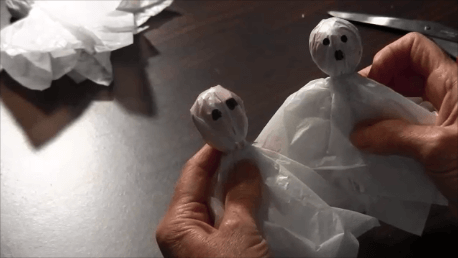 It’s time to get in the Halloween spirit and this is a quick and easy DIY fall craft, a lollipop pumpkin holder. This easy Halloween decoration makes a nice pumpkin centerpiece for your home or Halloween party. 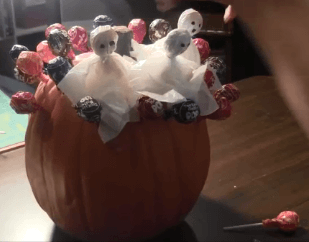 Learn how to make the lollipop pumpkin holder by watching the video tutorial and following the photographic step-by-step instructional tutorial below. 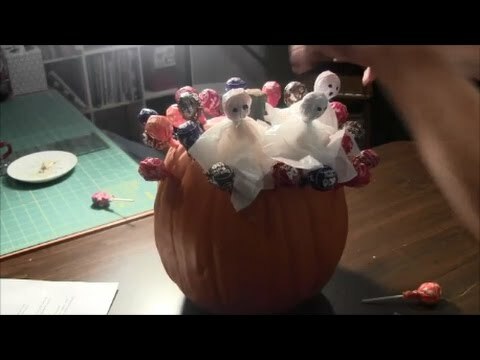 Click to watch the How to Make a Lollipop Holder from a Pumpkin video in Youtube. 1. Find a drill bit the same size as the lollipop sticks. 2. Hold the pumpkin sturdy and drill holes randomly. THAT'S IT! IT'S DONE! SO SIMPLE! SO QUICK! Enjoy your cute, lollipop pumpkin! If you are not home for Halloween, leave this lollipop pumpkin outside as a self-serve treat. Pumpkin 13 1/2" x 11" x 12 1/2"
Pumpkin 9" x 8 1/2" x 8 1/2"